You are here: Home » Rob's Blog » Video: Inside “Lee 1” with Jim Shine – How the General Lee was Born! Video: Inside “Lee 1” with Jim Shine – How the General Lee was Born! It’s not often that a kid gets to meet a childhood hero, but two weeks ago at the 2012 Barrett-Jackson Scottsdale auction I got just that chance. There I got the chance to meet “Lee 1” in person. Lee 1 is the very first General Lee ever made, and his first (and last) jump can be seen at the end of the theme song of every episode of the Dukes of Hazzard where he jumps over Rosco’s patrol car. He’s the only General to wear chrome rocker trim, had a hand painted confederate flag on the roof, misaligned numbers on the doors, and character out the wazoo. I had the good fortune of running into a man named Jim Shine at the auction, and Jim was a huge player in the restoration of Lee 1 a few years ago. I had planned to meet Jim at some point during the show, but I had no idea that he’d give us the full run through of the General right then and there. The video that you see here was an impromptu segment done with Jim where he walked through the history of Lee 1’s restoration, and all of the “secret” information about Lee 1 that would set the template for every General Lee that would be created from there on it. Every wonder why the General Lee ha vinyl roof trim, but no vinyl roof? Jim knew the answer and spilled the beans. Ever wonder if it’s hard to restore a car that has been jumped and then parked outside for nearly 25 years? (No brainer; it’s hard!) Unfortunately we didn’t get Jim directly mic’d up for this interview, so the audio quality is not as good as it could be. That being said, if you’ve ever seen an episode of the Dukes of Hazzard, watching this little short segment will give you more ammo for parties than you could ever imagine. Bubba Watson and Lee 1. 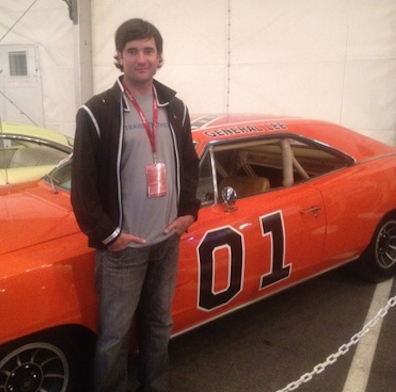 The General Lee did sell at the Barrett-Jackson auction and was purchased by pro golfer Bubba Watson for $110,000. While I’m a little jealous of Bubba it does seem like he has the right name to own this car. I read up a little on him and it turned out that he was born just 6 days before the General took flight. He had made a deal with his wife that if he ever won a golf tournament that he could get a General Lee. He did win, and now he has the General Lee. Pretty cool, Bubba! Jim, if you’re reading this, thanks so much for the full walk through of the General, and thanks for putting him back together again in the first place!